If you have heart disease, staying healthy during cold weather presents special challenges. For those with coronary artery disease (CAD), cold temperatures can trigger episodes of cardiac ischemia (oxygen starvation of the heart muscle), causing episodes of angina or even heart attacks. For people who have heart failure, a rapid drop in environmental temperature can lead to a sudden worsening of symptoms, an increased risk of hospitalization, and even an increased risk of death. So, for anyone with heart disease, the onset of cold temperatures requires special precautions. Fortunately, these precautions generally fall into the category of common sense. Your heart rate to increase. Your blood pressure to increase. Your heart to work substantially harder. An increase in the propensity for blood clotting. Limit your cold exposure. Limit the time you spend out in the cold weather, and if you go out, dress warmly, in several layers, cover your head and hands, and wear warm socks and shoes. Don’t exert yourself too much. As any EMT knows, shoveling snow is an excellent way for a person with heart disease to trigger a cardiac emergency, including angina, heart attacks, heart failure, and sudden death. Ambulance crews always make sure their vehicles’ gas tanks are full (and their defibrillators operative) if a snow storm is on the way. If you are going to shovel snow, do it when there’s an inch or less on the ground, use a smaller shovel, and push (rather than lift) the snow. Never shovel wet, heavy, or deep snow. And, many cardiologists insist that their patients never shovel snow at all. Snow shoveling, of course, is not the only way to overexert yourself during the cold weather. Walking more rapidly than usual is common when the wind is blowing in your face. Just being out in the cold pushes us to exert ourselves. Don’t let yourself become overheated. Dressing warmly then engaging in physical activity can lead to overheating. Overheating, in turn, causes blood vessels to suddenly dilate—which can lead to hypotension (low blood pressure) in a person with heart disease. If you are out in the cold and you find yourself sweating, you are overheated. If you have heart disease, consider this sweating to be a danger sign. Stop what you are doing and get indoors. Get a flu shot. Winter also raises your chances of getting the flu due to low humidity brought on by cold weather and indoor heating. The flu is potentially dangerous in anyone with heart disease. Get a flu shot. And if you feel yourself developing symptoms of the flu, talk to your doctor before medicating yourself. Don't drink alcohol. Avoid alcohol before going outdoors. It expands blood vessels in the skin, making you feel warmer while actually drawing heat away from your vital organs. Cold temperatures cause physiological stress on anyone. 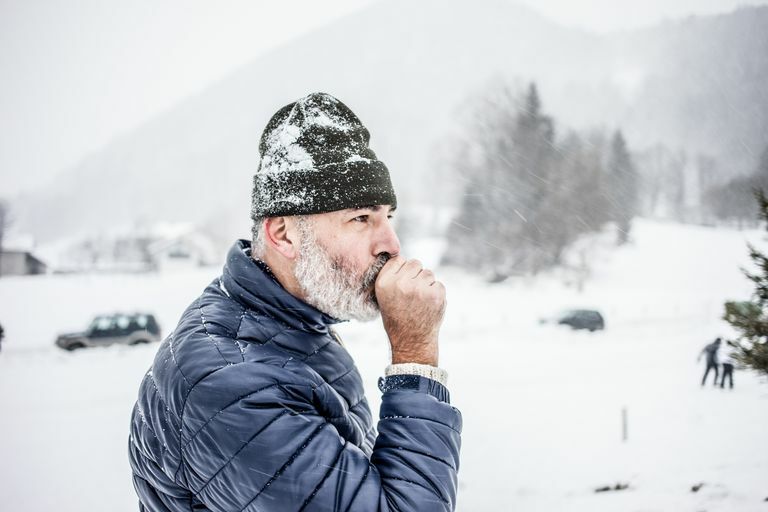 If you have heart disease, cold temperatures can be dangerous or even life-threatening. Make sure you take the common-sense precautions that can reduce your risk if you are in a cold environment.